This beautiful dress has been designed for that must attend event. 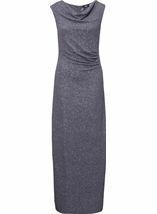 Crafted in a grey stretch fabric with an elegant cowl neck, sleeveless cut and gathering to the waist. It has been fully lined and has a concealed back zip fastening, deep side split that shows just the right amount of leg and is finished with an all over sparkle that catches the light with movement. Team with silver heels and accessorize. A small amount of excess glitter may fall from the garment. Back length 142cms. I ordered this dress for a black tie dinner. Wasn’t sure what to expect for the price. It is just perfect. Very slimming, beautifully made and really elegant. Great dress for the new year party. Very sparkly but also a little tight for me so had to be returned. Brought this dress for a cruise I love it a little long but I can still wear it. Looks lovely and expensive. Hubby loves it .i can’t wait to wear it. Will definitely buy from klass again . Loved this dress but like all of the other gorgeous maxi sparkle evening dresses was too long for me. Please either make them all shorter or offer two different lengths. Nice dress. Better than the picture. Good size. The sparkles do come off a bit so store carefully.